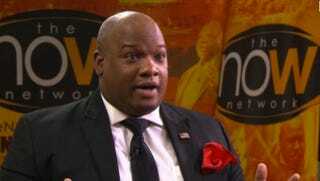 There is a name used in the South about unscrupulous men of the cloth: “jackleg preachers.” Given the evidence, it looks as if Pastor Mark Burns fits the bill. Burns, who came into national prominence this year as an unabashed Donald Trump surrogate and supporter who spoke at the Republican National Convention, was caught in a matrix of lies this week, which he dubiously tried to get out of on camera. In a Wednesday interview with CNN’s Victor Blackwell, Burns’ claimed biography essentially fell apart. First there was the question of his being a member of the fraternity Kappa Alpha Psi, which Burns claimed on his church website (the bio has since been taken down). When the national fraternity was contacted, there was no record of his ever having been a member. Then there was the issue of his military service. Burns claimed to have spent six years in the army reserve. Yet another lie, as the U.S. Army noted when contacted. Then CNN reporter Blackwell asked about his claim of receiving a degree from North Greenville University. You guessed it—not true. The university said that he attended the school for one semester. The reporter responded that he did not agree to those terms and Burns claimed that the line of questioning was “an attempt to destroy my character,” and then tried to blame the media for trying to silence him. “What I’m saying is this—in reference to the website, if there is inaccurate information on there that can easily be manipulated by other people, by hackers, people can create whatever they want to create,” said Burns. Burns then walked out and got into a van, leaving the reporter and camera crew at his church. I think the lies speak for what kind of person you are, Mr. Burns. Jes’ sayin.